When Will I Get My Pocket Folders? 4,000 and under Pocket Folders: Ships or ready for pick up in 2 business days from proof approval. Over 4,000 Pocket Folders: Ships or ready for pick up in 5 business days from proof approval. Pocket folder printing makes your presentations pop! Pocket folder printing adds interest and professionalism to your presentations. 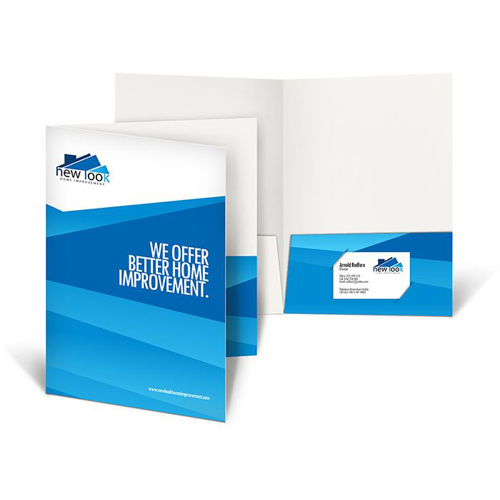 Delivering your marketing materials in a custom-designed pocket folder is sure to impress and catch the attention of potential clients or customers. Our quality, cost-effective pocket folders come with the benefit of our 48 Hour Turnaround Time Guarantee. High quality pocket folders can hold all of your promotional materials in one convenient package for prospective clients. Target specific customers, prospects or industries with a pocket folder of materials specifically selected for each. Hand them out before beginning a pitch or presentation, or give them to interested prospects at trade show events. Use our sell sheet printing services to fill your pocket folders. Include a business card and a personalized pitch letter on custom letterhead. Our catalogs and brochures also fit neatly inside our custom pocket folders. Consider including a branded bumper sticker, bookmark, or magnet to leave a lasting impression. For more great tips, check out our pocket folder marketing ideas and remember to review our pocket folder templates.